Looking for a super easy, flavourful stir-fry? This dish uses lean sliced pork tenderloin and crisp vegetables. With a tasty sauce that begins with a little zesty Italian dressing, it's a cinch to make and customizable with ingredients you have on hand. Meanwhile, mix soy sauce, corn starch and ginger until well blended. Heat dressing in large skillet on medium-high heat. Add meat; cook and stir 2 min. Stir in peppers and peas; cook 3 min., stirring frequently. Add onions; cook and stir 1 min. Stir in soy sauce mixture; cook 1 min. or until sauce is thickened, stirring frequently. Serve over rice. For a spicier flavour, add 1/4 tsp. crushed red pepper to soy sauce mixture before cooking. Substitute Kraft Asian Sesame Dressing for the Kraft Zesty Italian Dressing, soy sauce, corn starch and ground ginger. Cook meat, peppers and peas in 1 tsp. oil as directed. Add dressing with onions; cook and stir 1 min. 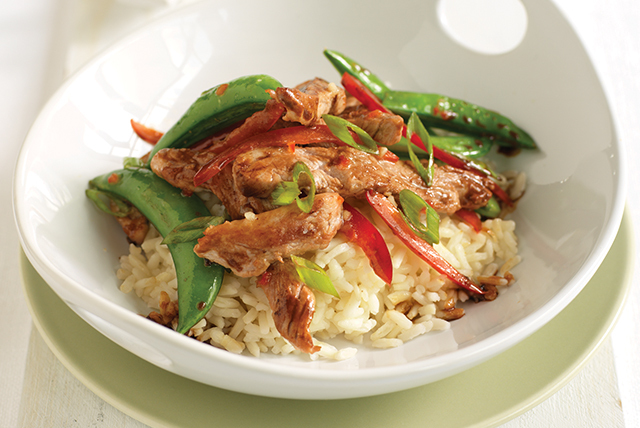 Substitute snow pea pods for the sugar snap peas. Enjoy this tasty meal. As a bonus, the red pepper provides an excellent source of vitamin C.